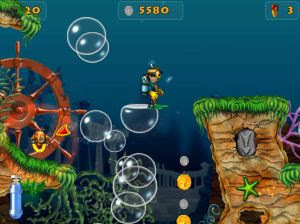 If what you crave for is a relaxing game experience, then join Kenny in his quest for treasures. This wonderfully-crafted game comes to life as Kenny, a brave young man, sets out on an underwater journey to search for a family relic. Crowned with the Crystal of Destiny, this relic brought good luck to his grandfather until it was stolen by pirates and broken into peaces. Now these peaces rest in different parts of the world. Your mission is to help Kenny find all the peaces and restore the family relic.